…we only have one rule. Read the rules! Can you see the black clad cyclist in the shadows? Falling off a bike can be very painful but having any sort of collision with a vehicle doesn’t bear thinking about. By following some common sense safety rules, you can minimise your chances of an accident. Know the Highway Code HERE but don’t quote it at motorists. ALL Oxted CC members are required to have 3rd Party insurance. We recommend British Cycling or CyclingUK membership for insurance and other benefits. 1: Fitness to ride. If you have ANY doubts about your health or suitability for exertion, see your GP. If you feel unwell on a ride, stop and tell others around you. If you are taking essential medication, let other riders know and/or use wrist or neck tags. If you have any allergies, please let us know. Use a heart rate monitor and study your data from time to time. 2: Visibility. Do not wear black or dark clothing on a road ride. Even on a sunny day, in shadows, you are invisible. Forget fashion, dress to be seen. Use flashing lights in all conditions to increase the chances that motorists will see you in good time. 3: Crash helmets are compulsory on all Oxted CC rides. Make sure you fit your crash helmet correctly. If it gets damaged, replace it. 5: Clothing essentials. Gloves or mitts are essential, the slowest tumble onto gravel can be very painful. Eye protection is essential, an insect or grit in your eye could cause a crash. Carry a rain jacket, even if rain isn’t forecast – if you’re stranded, you’ll be warmer with a rain jacket or gilet. If in doubt, wear too much, you can always take it off. 7: Food and drink. Eat well before you ride. Always carry a drink and snack. Also carry some cash. And never drop litter, gel wrappers or leave old inner tubes at the roadside! 8: First Aid. Attend courses when you can. Study the NHS First Aid pages online. Carry at least one large injury patch. Be familiar with CPR. 9: Emergency contact. It is possible to get lost on a ride or have a mechanical problem so don’t forget your phone. Ensure you have the ride leader’s number and he/she has yours. Note the club number 07970 507 657. Ensure you have an ‘ICE’ number (In Case of Emergency) on your phone. If you change your next-of-kin contact info, please let us know. 10: Check the weather before you leave home and dress accordingly. In winter, expect worse roads, fit tougher tyres and mudguards. If it’s icy, stick to main roads that have been salted or better, don’t ride, go to the gym. 11: Under 18’s are required to have a Parental Consent form signed HERE and returned to the club. CTT open events require a Parental Consent form for each event HERE. 12: Move into single file quickly if you hear traffic from behind. Also, beware of electric cars, which are almost silent. On hearing traffic from behind, riders at the back of the group call ‘CAR BACK’ which is the signal for the group to move PROMPTLY into single file to help cars pass. If a group is bigger than 6/8 riders, create a gap to help cars ‘bunny hop’ to get past. Be sure all cars have passed before resuming ‘two abreast’ and never ride more than two abreast. On busy roads, always ride in single file. On narrow roads, the rider at the front of a group, on seeing a car shouts ‘CAR UP’. 13: Most car drivers are considerate, avoid arguments with the few who aren’t. Don’t shout or make rude gestures. Don’t pass traffic on the inside. Be polite, good relationships with motorists matter. Using discreet cameras can help in disputes. 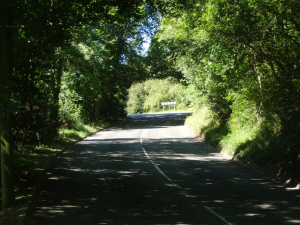 14: Our Ride Leaders endeavour to find quiet routes, with mostly left turns. But they cannot know it all, if you know an area better, please speak up. Be alert, bad drivers can appear on any road. 15: Staying in a group. Car drivers treat groups with more respect than solo riders, so stay with your group. ‘Buddy up’ with at least one other rider. If you are having difficulty keeping up with the group, let people know. If someone is falling behind, help them by going back but tell others first. The ride leader cannot be everywhere. 16: Junctions. Be very careful at junctions, look and look again. Be patient with traffic. Only call out ‘CLEAR’ for others if you are absolutely sure all traffic has passed BUT if you hear ‘CLEAR’ from someone else, double check again, in all directions! When you are slowing or stopping, shout what you are doing for others behind you. 17: Listen for traffic. Never ride with headphones. 18: No sudden moves! Think before you brake, is there anyone right behind you? Think before you turn, use clear signals, look back, in both directions. And don’t stop just after turning; what if a car comes flying around that corner? 19: Group size. The ride leader will determine the group size. Less than ten is preferred, larger groups should leave a gap to assist overtaking traffic. 20: Collisions with other riders. Don’t overlap your front wheel with the rear wheel of the bike in front. 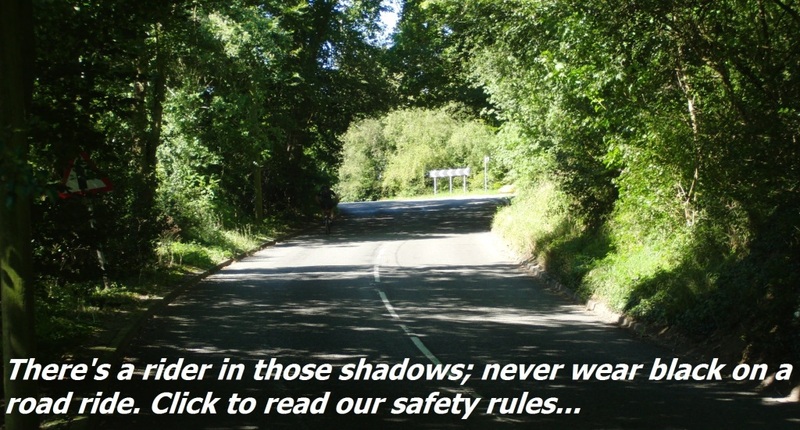 If you cannot see ahead, keep a gap in case the rider in front suddenly brakes. Be careful uphill: if the rider in front gets out of the saddle, they will slow momentarily and you could clip their wheel. 21: Bad road surfaces. Point out potholes to the rider behind you and/or shout ‘HOLE’. Shout if you see gravel, oil or bad surfaces. Wet roads can be slippery and when turning on a suspect surface, try to keep your bike upright. Use ‘compact hand signals’. 22: Horses. Alert horse riders by calling ‘BIKE’ as you approach. Horses and their riders are easily panicked by bikes suddenly appearing, unless they have some warning. Lookout also for other animals. 23: Passing obstructions. Use hand signals and/or shout that you are moving to avoid obstructions, runners and pedestrians. 24: Choose a safe place to stop. Don’t stop ‘just around the corner’ or just over the brow of a hill, get right off the road, leave motorists clear sight lines. 25: Going fast downhill. Crashing at speed will result in injuries. Don’t race or chase other riders downhill. Look well ahead, particularly at the road surface. You have more control if ‘down on the drops’ of your handlebars, not ‘on the tops’. 26: Cornering. Learn to corner safely. Don’t take chances cornering, drop your speed before the corner, not during the corner. Watch out for gravel, oil, leaves or ice and warn others. If you’ve entered a corner too fast, shifting your body weight and keep the bike more upright, just keep it smooth. 27: Don’t make things worse! 1) At any accident think first about oncoming traffic! Appoint people to warn traffic. 2) DO NOT move the faller, unless absolutely necessary, reassure and give them time to overcome the shock. 3) Administer first aid <HERE> ; injuries always seem worse at this point. 4) Use bandages/patches, there is less trauma for the rider if they don’t look at their injuries. 5) If in any doubt, call an ambulance. 6) If vehicles are involved, take the registration numbers and call the police. 7) INSIST on a breath test and an eyesight test. (you’d be amazed at the number of drivers who forget their glasses/contact lenses). 8) INSIST that the driver’s phone is checked IMMEDIATELY for recent calls and texts. 9) Take photos of the crash scene. 10) If the faller can be safely moved and doesn’t need an ambulance, it is sometimes quicker to get a taxi or kind motorist to take them to hospital. 28: Racing, race training and time trialling…are all advanced levels of cycling which require all of the above plus close riding skills at speed. You cannot race in the Surrey League without accreditation via two days of special training. ‘Chain gang’ training is very close and fast, some sessions are after dark so good lights and bright clothing are essential and it is vital to listen to the Ride Leader’s instructions. 29: THE BIGGEST RISK…is being so worried about risks that you don’t cycle! NOT cycling can cause a very unappealing body shape, furred up arteries and a lack of energy for life generally! We are affiliated to British Cycling and endeavour to conform to British Cycling Best Practice Guidelines. We also endeavour to apply the British Cycling Equality Policy and Code of Conduct. Our Club Welfare Officer is fully conversant with the British Cycling Safeguarding children and young adults policy. We are also affiliated to Cycling UK, Surrey Cycle Racing League, Cycling Time Trials, East Sussex Cycling Association and the Southern Counties Cycling Union.